Between them, our three authors have either written or contributed to a dozen Frommer's travel guides to Quebec over the years. They have returned to these two, colorful, pleasure capitals of Quebec for this brand-new edition, which reflects their most recent discoveries in attractions, lodgings, meals, cultural highlights, and shops. Using the Easy Guide approach, they limit themselves to the very best in all price ranges--truly an "easy guide" to use and savor. Matthew Barber writes about food trends and cooking for the Boston Globe. He lives with his wife, Leslie Brokaw, and their son and dog in Boston, MA. Leslie Brokaw has been a travel writer since 2006, contributing to more than ten Frommer's Guides to Montreal and New England. Her first books were coauthored with her stepfather, long-time Frommer's contributor, Herbert Livesey. She lives in Boston, MA. Erin Trahan is a Boston-based writer and editor who specializes in film and travel. 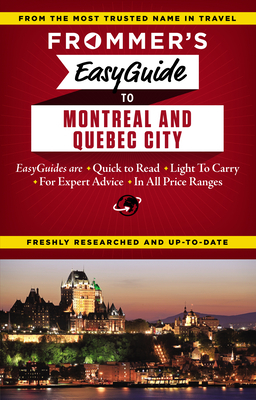 This is her sixth Frommer's Guide to Montreal and Quebec City.